Pond animals join little ones in the tub. 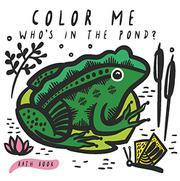 The flora and fauna of the pond come to life in this bathtime book. Bold black-and-white illustrations are printed on foam-filled fabric-paper pages, thick lines creating easily identifiable creatures that are also fairly realistic. When the book is submerged in water, bright primary colors spontaneously burst through, bringing the animals to life. Little ones will delight in having a book to read in the tub. Caregivers can also give their little readers paintbrushes and cups of water to dip in and “paint” the animals by hand. The animals include a swan, a water vole, a family of ducks (that, charmingly, say, “quackity quack”), a fish, and a dragonfly. Series companion Color Me: Who’s in the Ocean publishes concurrently and features a crab, a jellyfish, a whale, an octopus, and a sea horse. The fabric dries quickly and is ready to be dunked in the water many times over.